On a sunny field in Quintavia, 84 archers shot for the honor of serving Their Majesties as Royal Archery Champions. Queen Avelina proclaimed that Her Champion would be the winner of the tournament, and that only an archer who could out-shoot Her could hold that title. King Kenric declared that he would select His Champion based on who impressed Him during the competition. The Captain General of Archers and outgoing King’s Champion, Mistress Jehannine de Flandres, reminded all participants of the duties of the Champions and said that anyone who wished to withdraw from the final round could do so with honor. The day’s tests of skill were designed with a Chinese theme. Outgoing Queen’s Champion, Master Li Kung Lo, explained that Emperor Chin has called forth all mercenaries to defeat his aunt, the evil Empress Wu. She has used her magic to cause dragons and other creatures to do her bidding. As dragons are avatars of the gods, it would anger the gods if any dragons were shot, thus any hits on dragons throughout the day would score negative 1 point. All participants were able to shoot the full course of 8 targets, at the end of which the finalists would be selected. The tournament began with a long-distance shoot at Empress Wu with an ensorceled dragon at her feet. The second shoot was at increasing distances; archers could only proceed to the next distance if they did not miss. There followed a sumptuous lunch, after which competitors formed into small groups and proceeded to each of 6 stations. Three stations had timed shoots: Rats and Rat King, Egg-Stealing Monkeys, and Bats. The other three stations were 6 shots, untimed: Empress Wu being overpowered by a Dragon (a friend/foe shoot), an Assassin, and a Hunting Shoot (at 3D animals). 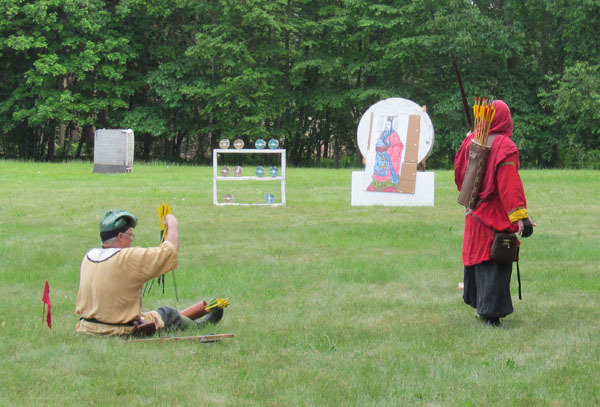 There was a 5-way tie of archers with a total score of 38. 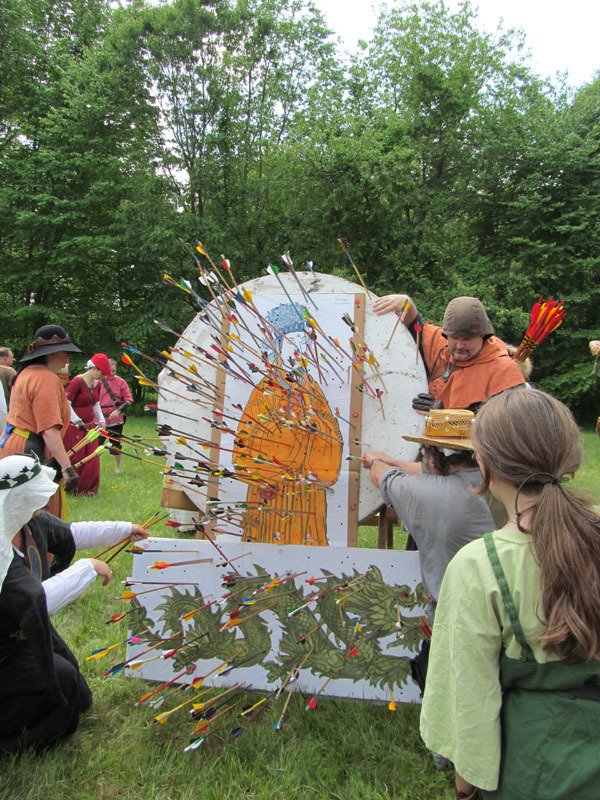 Two of these archers — Kira Asahi and Cosimo di Venezia — were no longer on-site. The other three — Nest verch Tangwistel, Alec Craig and Julienne Ridley — shot-off for the 16th spot, and Julienne prevailed. The final round was a version of the now-traditional head-to-head pairing. In this story, Emperor Chin has reneged on his promise to pay his mercenaries. So, each archer had to knock down 5 “coins”, and the first to shoot Chin would win and advance to the next opponent. Photos and text by Mistress Ygraine of Kellswood, additional photos by Eleanora Stewart. Video by Baroness Arlyana van Wyck.